Welcome to a new way of thinking when it comes to Orthopaedics. At Ortho Xpress, we have created a way to treat common ortho accidents and other ailments in both a fast and effective manner. Our expert staff is able to diagnose, treat and release patients more quickly than most any other clinic in our area. Please take a moment to find out more about what we offer and how we can assist you! Yes, we aim to take care of your visit as soon as possible. However, don’t mistake swift action for oversight. We pride ourselves in diagnosing your condition with the highest degree of medical specialty. If we can’t resolve your situation in the manner it deserves, we will provide you with further treatment options to take care of the injury. Yes, our expert care and efficiency is our top priority when pointing you toward quick, effective healing. 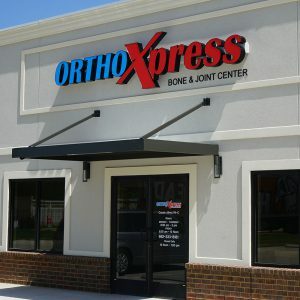 However, as our name implies, convenience plays a big role in what we offer from the Ortho Xpress Bone and Joint Center. We don’t like to wait any longer than necessary . . . and we don’t expect you to either! Click here to learn about our easy check-in experience. As you can gather by our website . . . speed does heal! Convenience is not the only benefit that comes from choosing Ortho Xpress. Getting your injury seen and diagnosed quickly means you get better sooner – and you potentially get ahead of any further injury that might occur due to waiting. Our new Holly Springs center opens this June!